At Plaça del Sol square in Gracia quarter there's a modernist building that really stands out due to its wonderful preservation. I have seen it in hundreds of pictures but I wanted to show my own version. Remember that you can always enlarge the image to see the shot in all its splendor. These are the real colors so imagine what a feast it was for my eyes to be able to contemplate this beauty from a terrace table across the square in the company of friends and chatting over some beers. It's a really beautiful façade. Neat looking building. The antenna on top looks so out of place. 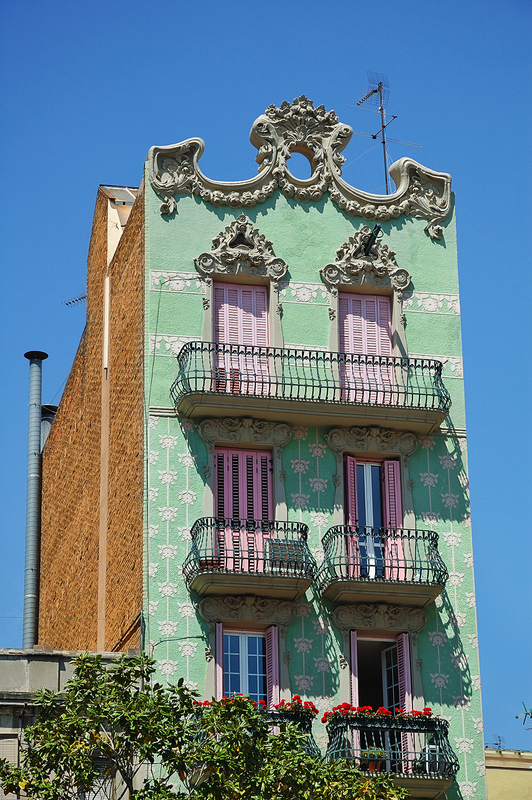 Yes I agree, it is a lovely building, just love the balustrades and the colours. What a beautiful house. Very nice shot. I'd love to know how they made and then attached the ornate decorations. It looks like cake frosting. Those colours are really crazy!! And then with the addition of the red geraniums!!?? I'd be curious to know the history of the place, and see who lives there today. Lovely photo, though, and a perfect time of day to capture the shadows, enhancing the depth of the ornamental details. I'd try bringing down the exposure and putting in a bit more contrast to darken the balcony shadows. The colors and detail on this facade are excellent. Really enjoy the shutters and balcony.